This water bottle holder is designed to hold a large Nalgene reusable bottle or a 32 ounce water bottle. 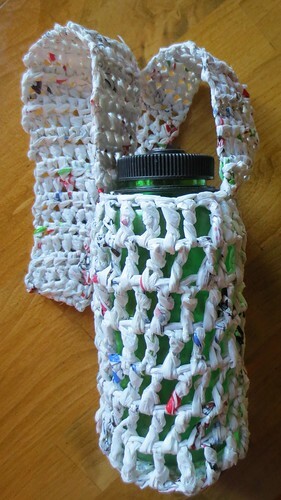 I used this free crochet pattern to make the water bottle carrier but with a shorter strap. The original pattern calls for a long strap that can be worn across the body. This water bottle holder has a 31 inch long strap and is designed to just be worn over the shoulder by an adult or across the body for a child. Recycled plastic bag yarn or plarn, makes great water bottle holders. You don’t have to worry about the bottle sweating and I think the plastic actually helps keep the bottle cold. Anyway it is a great way to recycle bags and make a cool water bottle holder. If you don’t crochet, I do offer these holders for sale on my products page.